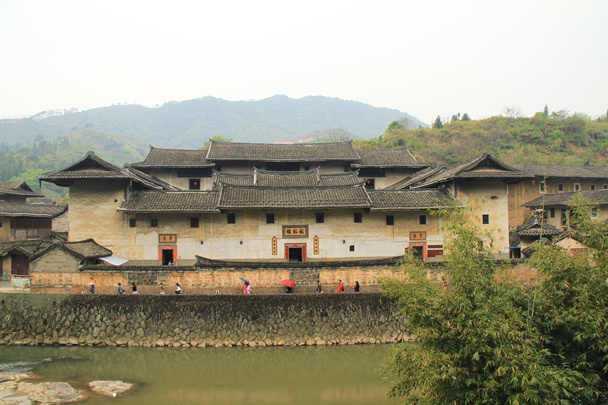 In Brief: A four day trip that took us into the mountains of Fujian to explore the tulou buildings of the Hakka people, and to Xiamen to see both ancient and more recent cultural and historical sights. 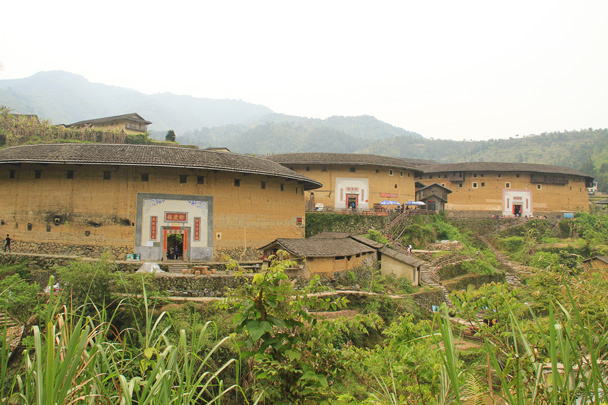 Tulou buildings in Fujian Province. 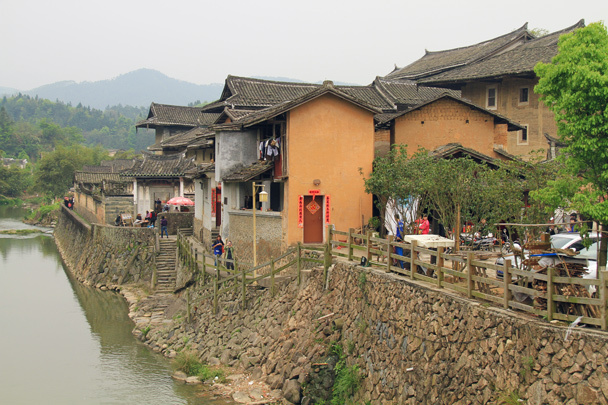 As well as spending two days looking around the villages, valleys, and rice terraces where the tulou buildings are sited, we visited various sights in Xiamen – the Huli Cannon Fort, the seafood market, and the island of Gulangyu. 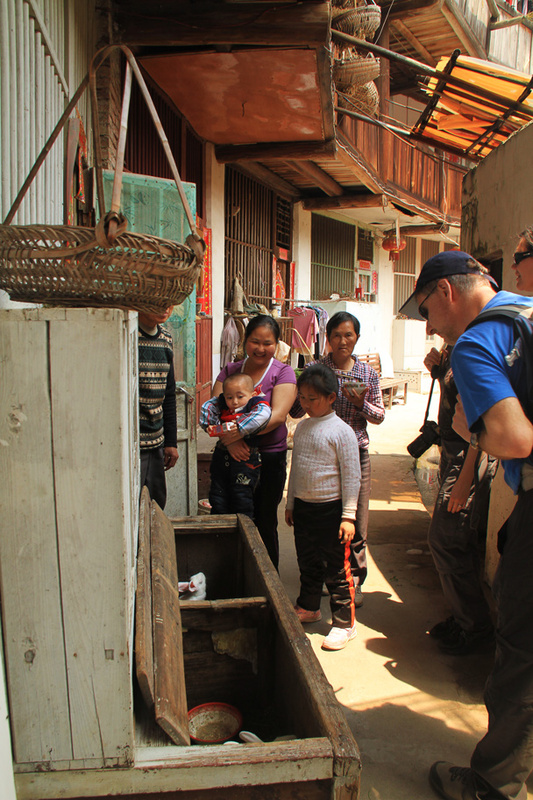 We flew into Xiamen from Beijing, and after checking in at our hotel we went out for a walkabout. 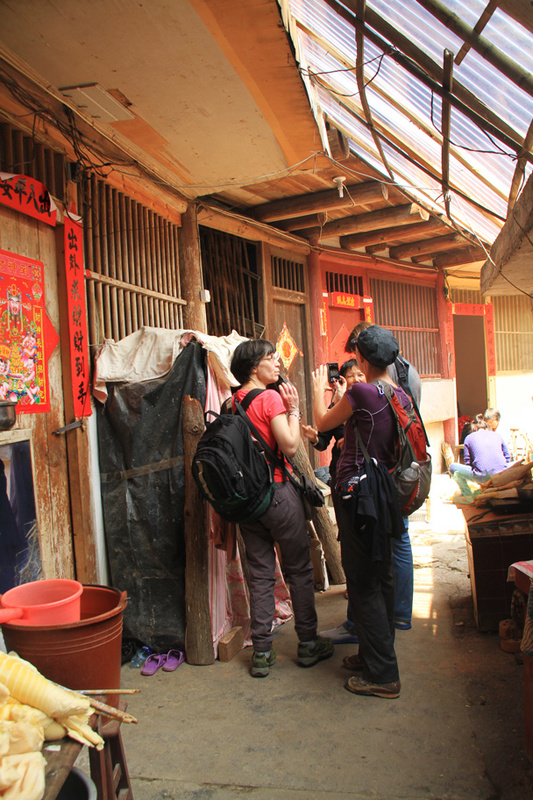 The first stop was the Huli Mountain Cannon Fort, the site of Xiamen's (known as Amoy at the time) old coastal defences. The fort saw action from 1894-1896 and was successful for a few battles, bristling with all sizes of cannons that protected the harbour. Conveniently close to the fort is a seafood market and shopping street, where we headed for a tasty dinner and then a wee evening walkabout before returning to rest at the hotel. 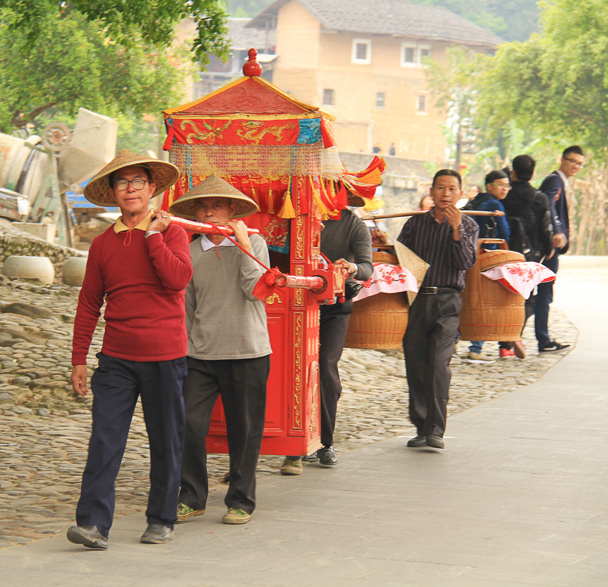 The next day we woke up early for the main event of the trip, the exploration of the villages, valleys, and unique architecture of the tulou area in Yongding County, a 3 hour drive out of Xiamen and into the mountains. 'Tulou' translates literally as 'earth building', and rammed earth is what they are mainly constructed of. 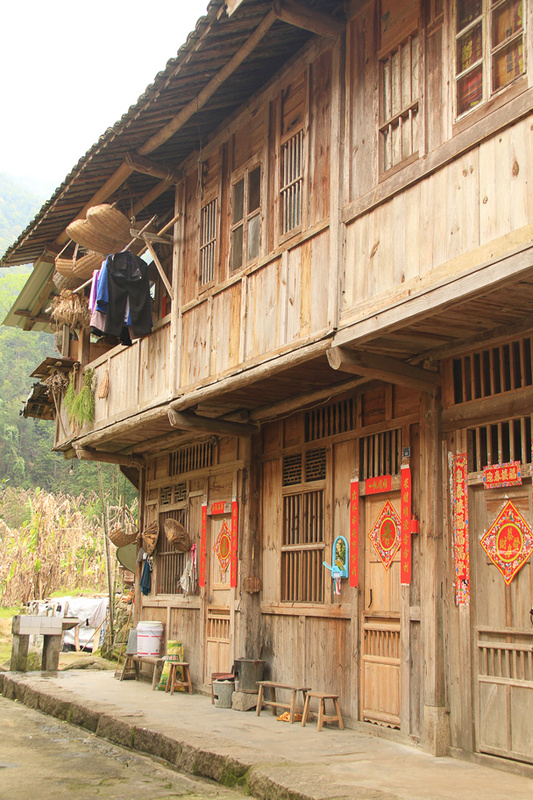 The buildings are usually circular, although some are square, and they are typically home to a clan, with several generations living inside. 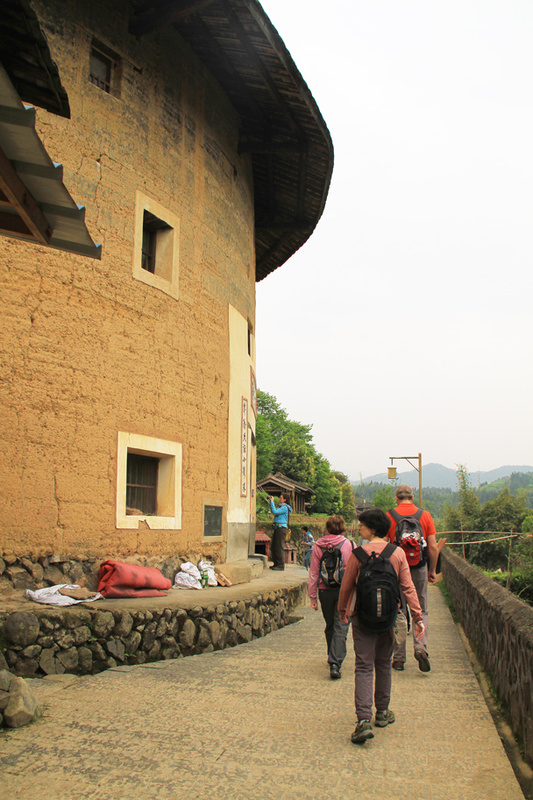 We were able to stay overnight in one of the tulou buildings, an experience that gave us a glimpse of what it would really be like to live inside. 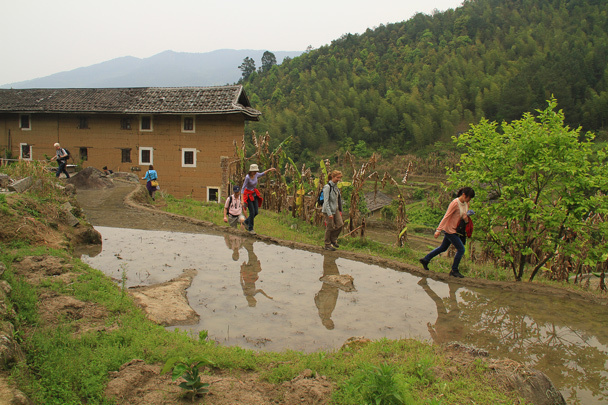 We stayed in the area for two days, which gave us plenty of time to look about several clusters of tulou, and we made sure to do a bit of hiking as well, following trails past paddyfields up into the hills. On the last day of the trip we returned to Xiamen with enough time to take in the sights of Gulangyu Island before our flight. 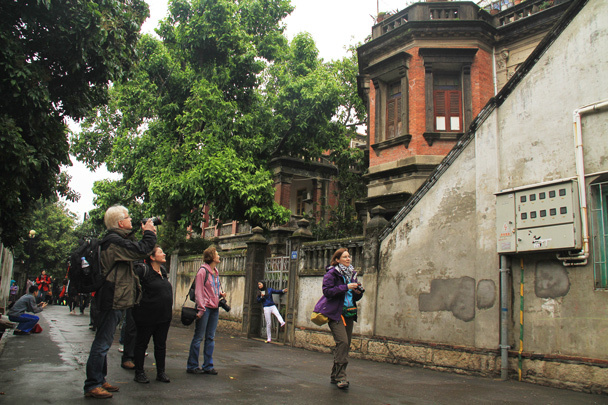 During the Qing Dynasty, Xiamen was an important trading port, and Gulangyu Island was where all the embassies and trading houses of European countries were found. Much of the architecture on the island is in the Victorian style, and with no private cars allowed on the streets it is a great place to take a stroll and explore the alleys, beachfront, parks, and the restored Victorian houses. 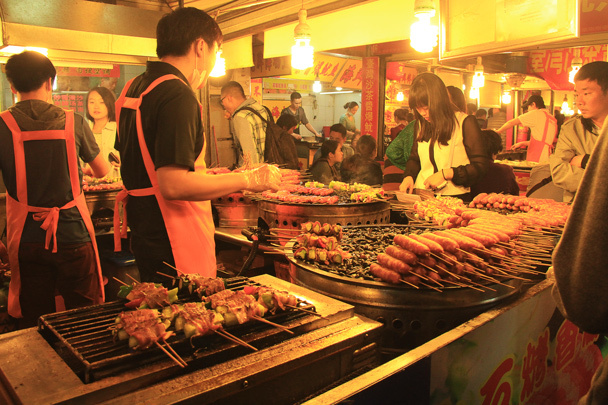 Street food at the night market in Xiamen. 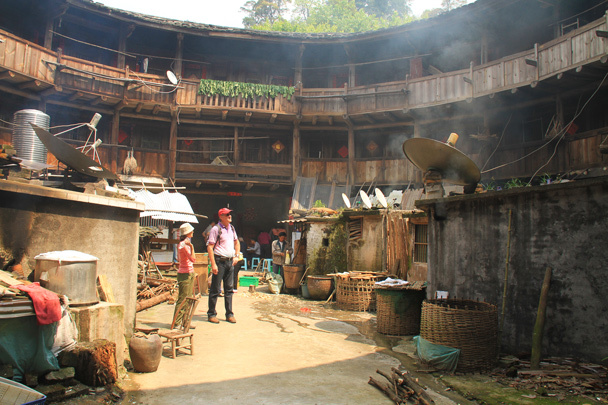 Inside a tulou building in Yongding County. There's something interesting in this box. 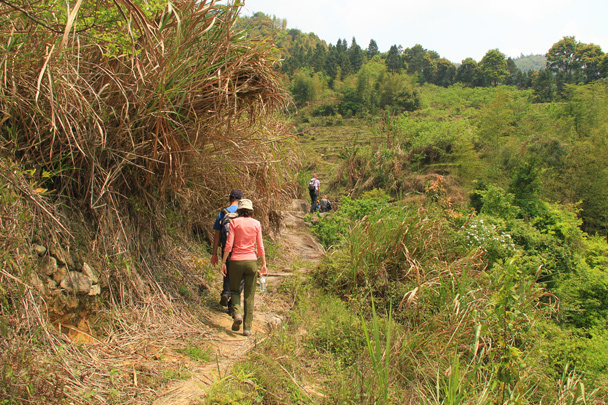 Hiking field trails behind the village. 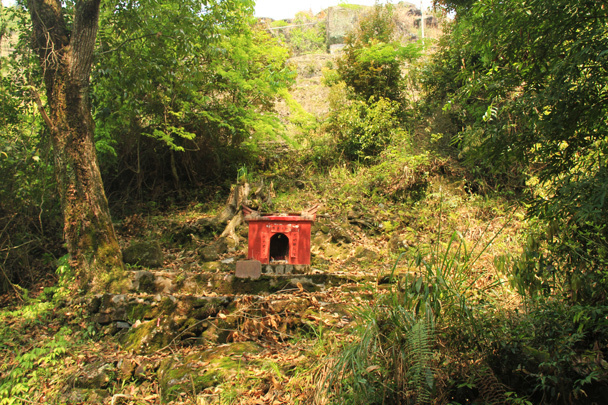 An ancestral shrine behind the village. An ancient building with modern additions in the communal courtyard. 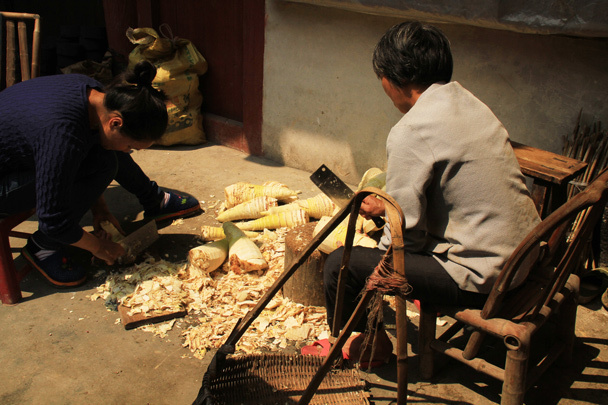 Chopping up yams, one of the staple foods in the area. 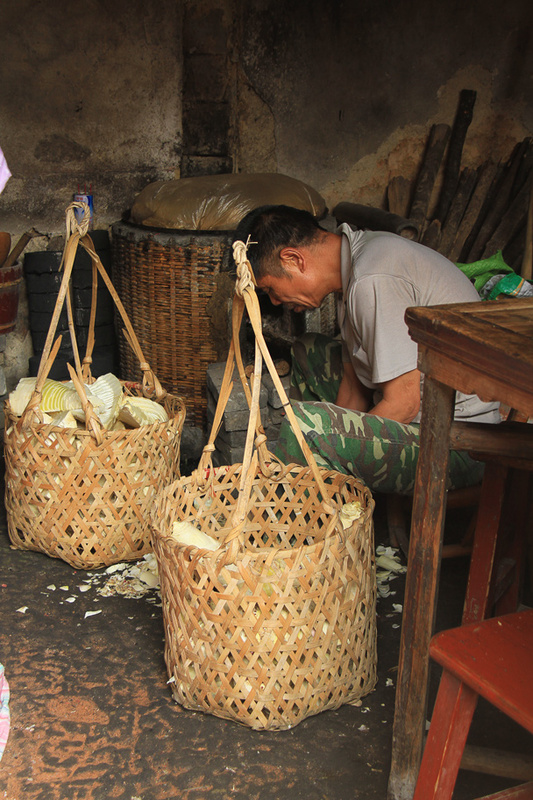 He's helping too, peeling the skins before the chopping. 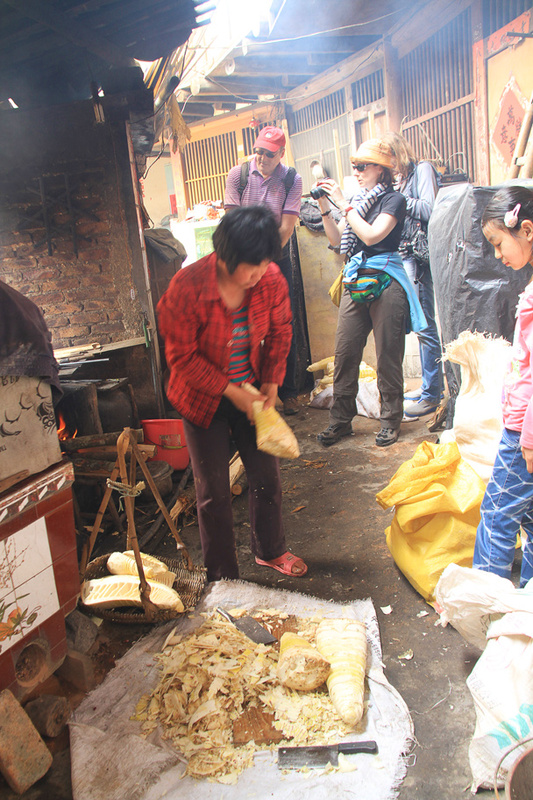 The cooking area of the tulou building. 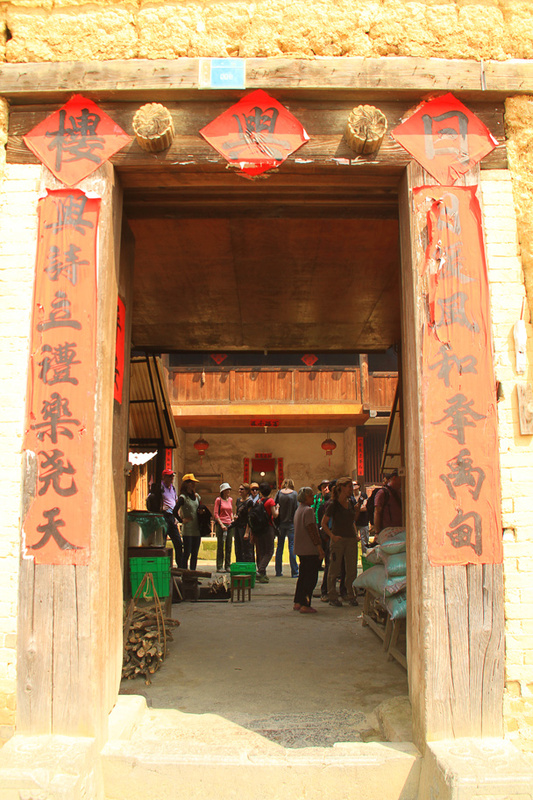 The main gate of the building. There's usually only one entrance, although some of the buildings have secret escape tunnels. 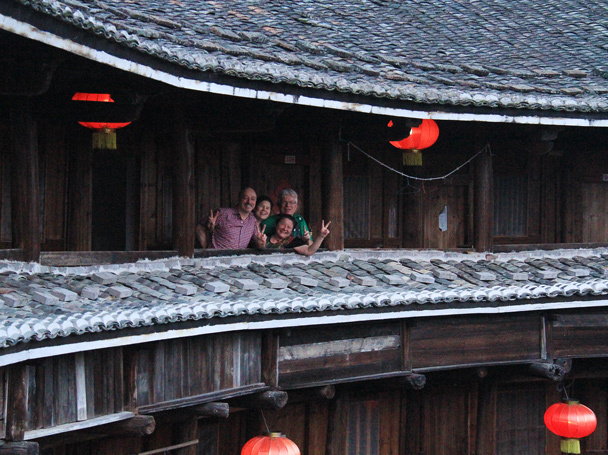 Friends on the upper balcony of the tulou building. A view of the courtyard inside. 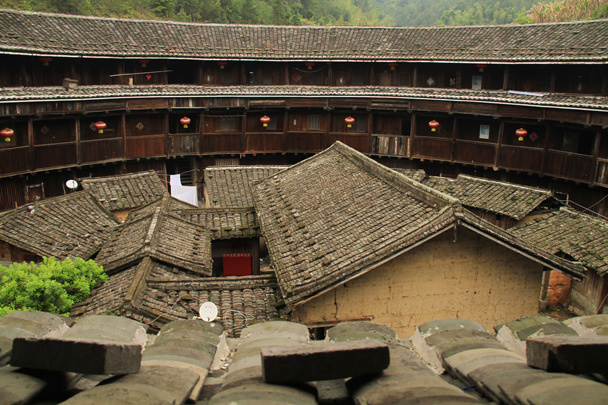 This tulou has extra halls and rooms inside; some of the tulou buildings have an open courtyard. 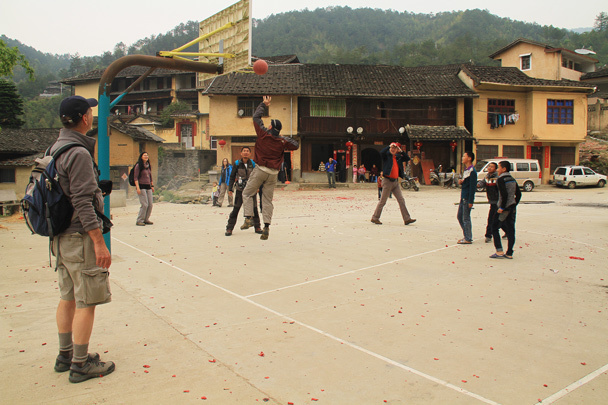 We took over the basketball court – the village youngsters were no match! 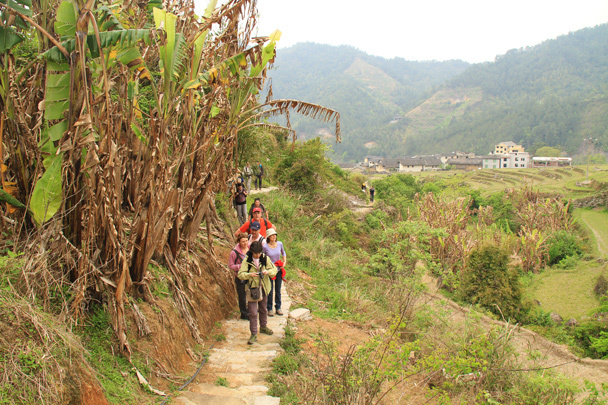 An easy walk up into the hills behind the village, following trails past rice paddys. Wood is one of the main construction materials. Tiptoeing along - don't fall in! 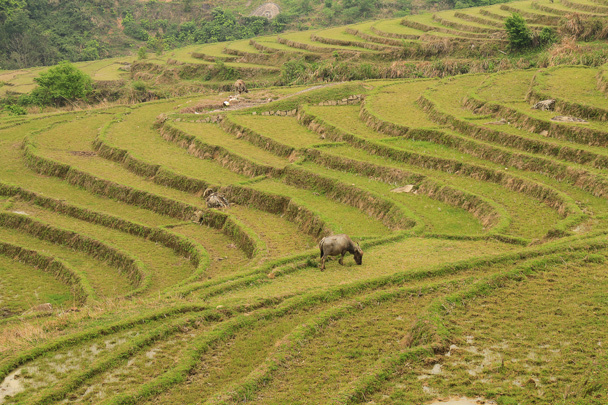 A water buffalo grazes on a terraced field. 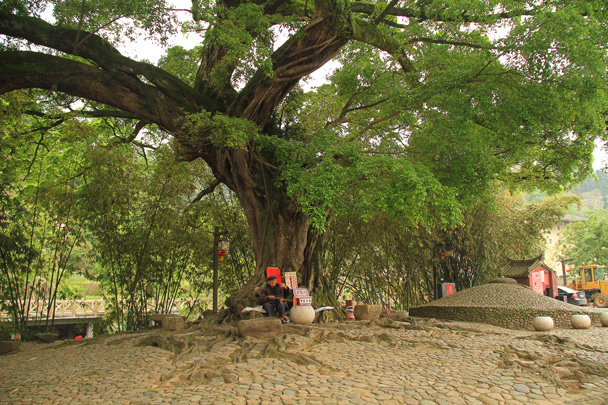 An elderly man playing erhu (two-stringed violin) below an even more elderly tree. 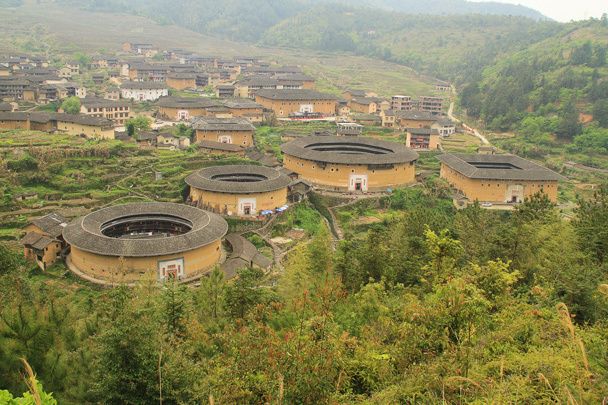 A view from above of the Chuxi tulou cluster. And a view from ground level. In this area a lot of tea is consumed. 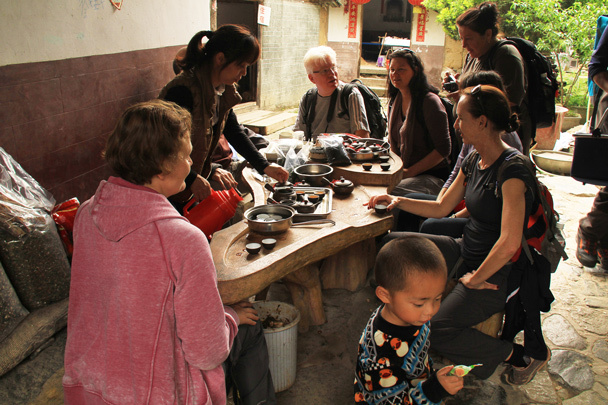 As soon as you sit down anywhere, out come the teacups, to be filled with locally grown green tea. 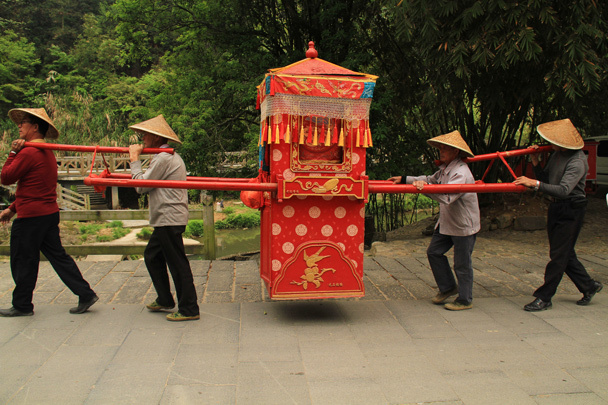 A palanquin like this is typically part of a wedding ceremony. Is the bride inside? Perhaps they're on the way to pick her up. 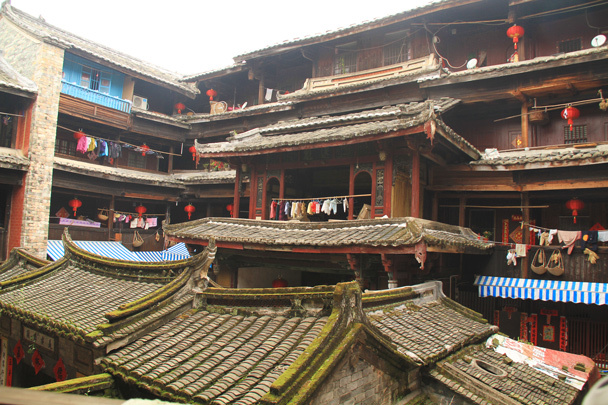 Balconies and halls inside a square-shaped tulou building. 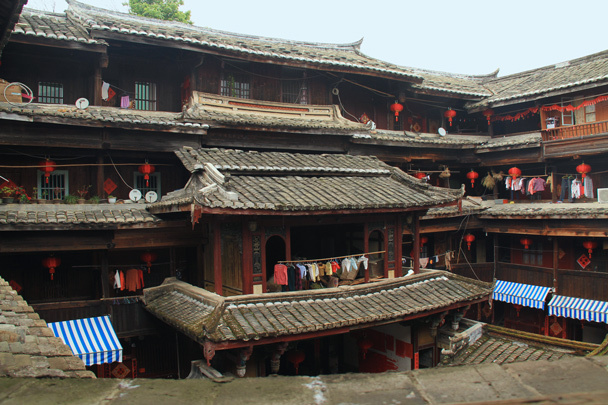 Very ornate architecture, all constructed with wooden joints and pins. 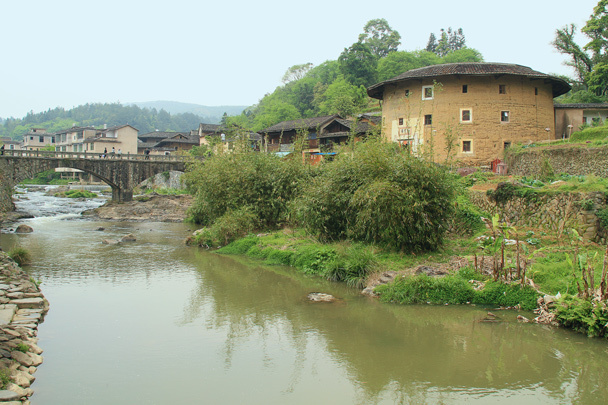 In a different area, we took a stroll along the riverside and explored another cluster of tulou buildings. 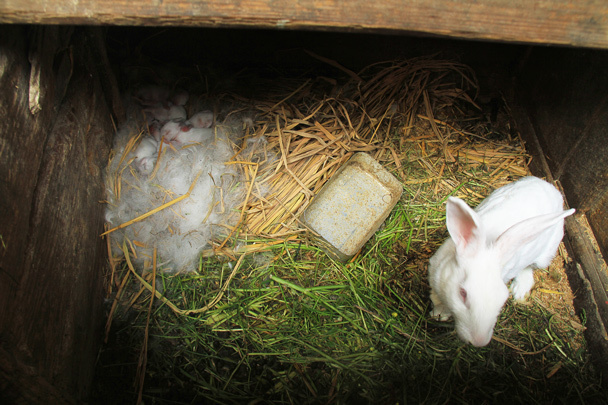 A very large family compound. 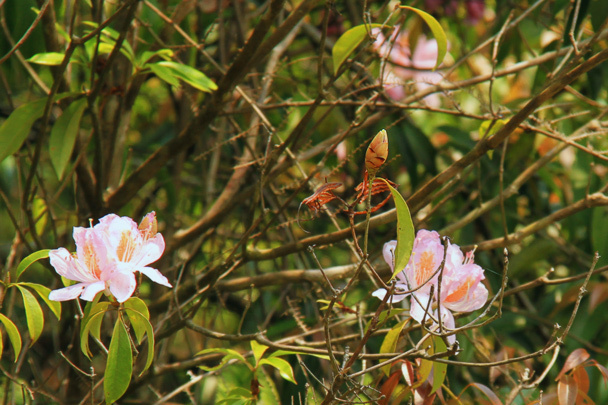 And then we headed back to Xiamen for a look at the mysterious island of Gulangyu. 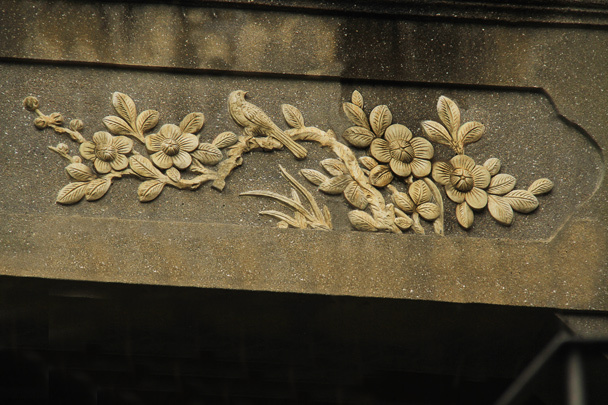 Ornate decorations in the concrete eaves of a Victorian-era building on Gulangyu Island. 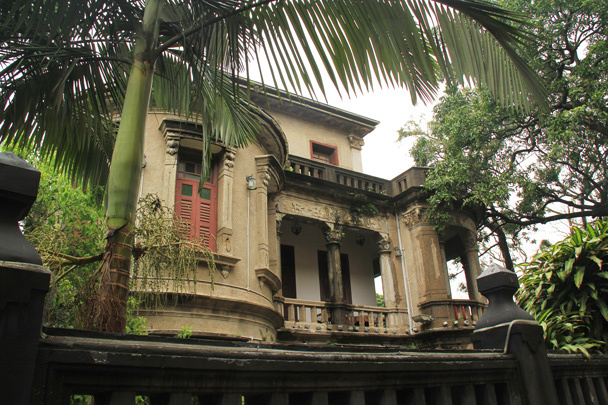 This sort of building is found all over Gulangyu Island. Street scene on an old lane on Gulangyu. 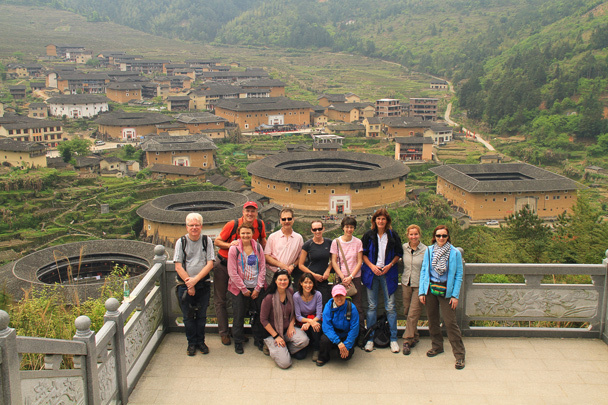 The hiking team at the Chuxi tulou cluster. 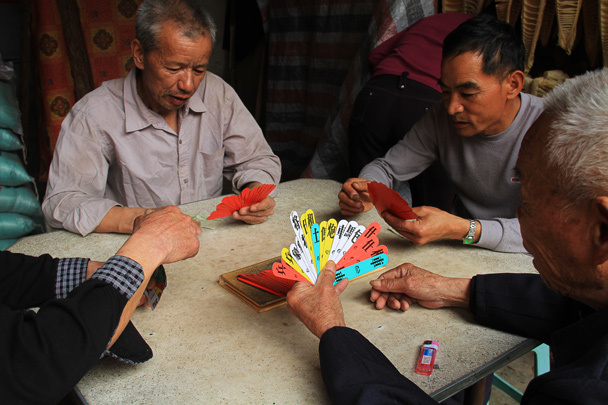 In Brief: Photos from a camping trip at the Gubeikou Great Wall – one day clear and lovely, the next foggy and mysterious.